Killer Characters: Giveaway! How was your Valentine's Day? Giveaway! How was your Valentine's Day? So, did everyone have fun on Valentine’s Day? We had a party in the Read ’Em and Eat complete with heart shaped cupcakes and cranberry-lemonade juice. Members from all the book clubs were there and a battle broke out when Bridgy asked which novel the folks thought was the most romantic. Jocelyn Kendall announced there was no story every written more romantic than Romeo and Juliet, which prompted Augusta Maddox to shout, “Are you serious? How do you compare that spoiled baby Romeo to a real man like Mr. Darcy? For my money it is Pride and Prejudice all the way.” The tug of war began in earnest when the other adults jumped into the fray. But the teen club saved the day when its members stood united in favor of The Fault in Our Stars, out numbering the squabbling adults. Then we played party games and gave out prizes. And aren’t you glad we saved a prize for you? 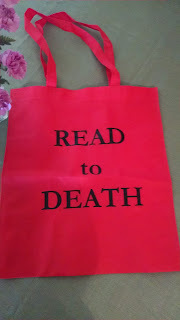 For a chance to win this Read to Death Valentine tote please comment below. You might want to mention a romantic book or talk about Valentine's Day in general. Don't forget to leave your email addy using this format: NAME (AT) SERVER (DOT) COM to avoid the spambots. Winner will be chosen at random. Giveaway closes at midnight your time on February 21st. It is always great to hang out with you for a while. 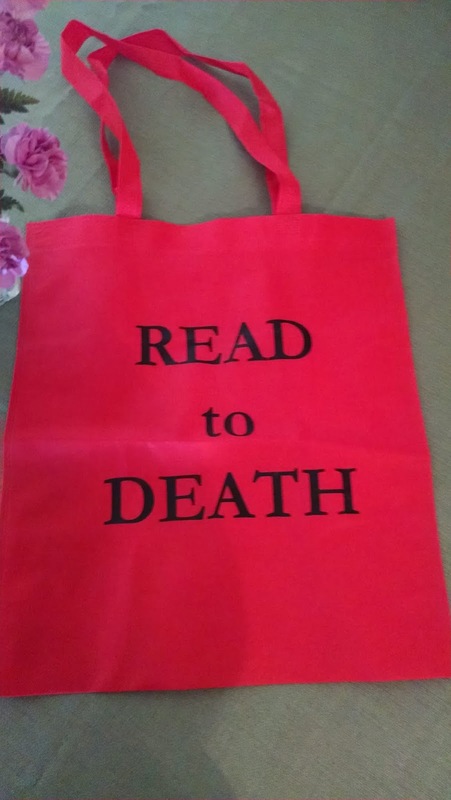 If you want to follow along in our adventures you can find us in Well Read, Then Dead, Caught Read-Handed and Read to Death. I had my usual Valentine's Day. My husband gave me a small gift and we had a special dinner. Spent a quiet Valentine's Day at home with a nice dinner and a good movie. I made sugar cookies for the kids (only 6 got them, the other 2 live 2.5 hours away). My husband and I don't really do much of anything for Valentine's day... Valentine's Day is a special day for me as it is my brother and sister in law's anniversary. They celebrated 43 years this year! Thanks for the chance!! Didn't do anything for Valentine's Day, but love the "after" candy sales!! My Cajun hubby made me a garlic and butter shrimp dish over linguine for Valentine's. Simple, yet delightful and delicious! Afterwards I was reading Josie Riveriera’s I Love You More. The whole town seemed to be strewn with red hearts for Valentines. Very pretty. My husband of 45 years gave me a beautiful and touching card and my grandson took me out to eat. Giveaway is closed. Winner has been notified. Many thanks to everyone who participated.